Hello, forex friends! Fed Chairperson Yellen and friends decided to keep rates steady and the Greenback weakened across the board while dragging its fellow safe-havens with it, as risk appetite returned to the markets. What happened? Well, here are 3 things you need to know about the most recent FOMC statement. As highlighted above, Fed officials downgraded their 2016 projection for GDP growth and inflation. GDP is now expected to grow by around 2.2%. This is lower than the median projection that was presented during the December meeting wherein GDP was expected to grow by around 2.4%. GDP projections for 2017 were also downgraded from 2.2% to 2.1%, but the longer-term projection that GDP will grow by around 2.0% was essentially unchanged. Moving on, inflation was also downgraded, from the December FOMC meeting’s expected increase of 1.6% to just 1.2%. However, similar to the longer-term projection for GDP growth, the longer-term projection that inflation will rise by 2.0% is still essentially unchanged. According once more to Fed Head Yellen’s opening remarks at the FOMC presser, the downgrade was due to the “earlier declines in energy prices and appreciation of the dollar” that “could well continue to weigh on overall consumer prices.” However, Yellen and her fellow FOMC members believe that these deflationary pressures are just “transitory” in nature, which is why they still expect to hit their 2.0% inflation target. FOMC members were no longer too keen to hike rates in 2016. As you can see above, the median path for the policy rate back in December was 1.4%, which implies that the Fed has room for three to four 25 bps rate hikes, with the current 0.50% rate as the starting point. However, FOMC members now think that the median path for the policy rate is 0.9%, which suggests only one or two 25 bps rate hikes in 2016. Just as interesting, but not as important, is the range of policy path projections since the lowest projection is 0.6%, which means that someone thinks that there should only be one rate hike or none at all for this year. And we know there’s only one person because of the dot plot chart that was provided by the Fed. 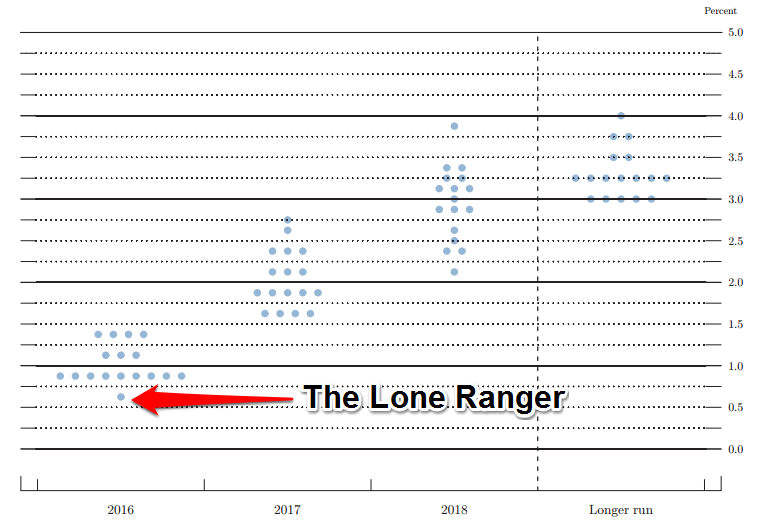 Unfortunately, we’ll have to wait until the meeting minutes are released to know who this lone ranger is and why he or she is not in a hurry to hike rates. And as I noted earlier, the FOMC members downgraded their GDP growth estimates because of weaker business investment and softer exports due to lower oil prices and “subdued foreign growth” respectively. In short, the reason why the FOMC members decided to maintain the target rate at 0.50% is not because of any inherent weakness in the U.S. economy, but because of risk factors from the global economy. Incidentally, this is a complete turnaround relative to the December meeting wherein they said that external risks were not that much of a problem. In simpler terms, she clarified that there are no problems… yet. Still, the downgrades to the economic forecasts, the slower path to tightening, and the overall dovish tone were more than enough to sour sentiment on the Greenback.